Skill: Children will add two addends with sums to 20. You will receive a 24 page ebook. 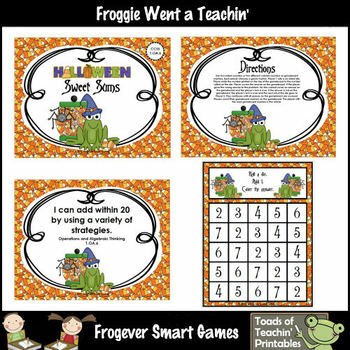 Your ebook includes (3) Storage Labels, Directions, (15) Gameboards, (2) I Can Statements for First Grade and Second Grade, (2) Graphics Credit Pages, and a Thank You Note. Children will solve addition problems by playing a game where they roll a die and add the number to the given number at the top of the gameboard. There are enough boards for your entire class. You could set the timer for a period of time for partners and then let them exchange boards when the timer goes off for another round with a different gameboard. 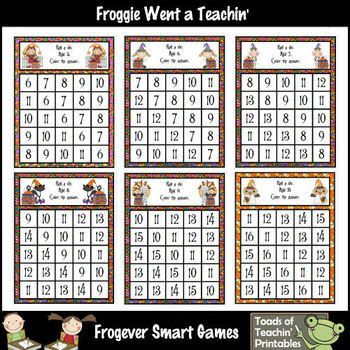 What a great way for your entire class to practice fluency with sums to 20 and have fun at the same time! Also great to place in a math center or partner activity in small group. Gameboards feature adorable Candy Jar Stick Kids and Halloween Candy Animals by Dana Murray @ Scrappin Doodles. Note: 2 Storage Labels are programmed with the CCSS and one Storage Label is not progammed with the CCSS. This has been done to accommodate all teachers. Not every state participates in the Common Core Standards and it also accommodates those teachers outside the US. *** See Pictures for everything that is included in this download. Graphics Credit: See Graphics Credit pages inside the ebook for clickable links to the 2 Graphic Artists who provided the adorable artwork for this product. Multi-User Licenses are available at TpT for one half the selling price of the product. If you download this product please take some time to rate it and provide me with some feedback. 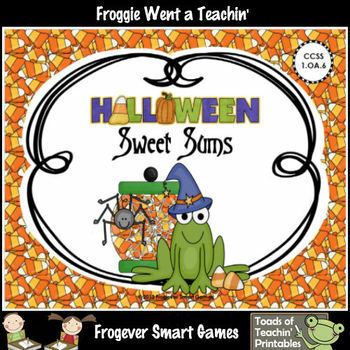 As well, please consider becoming a follower of my TpT store so that you will receive notification when I post more "Frog"tastic resources, centers, and games to the TpT site. I would "toadf"ally love it if you follow me! Halloween Sweet Sums by Shelia Hickman is licensed under a Creative Commons Attribution-NonCommercial-NoDerivs 3.0 Unported License.